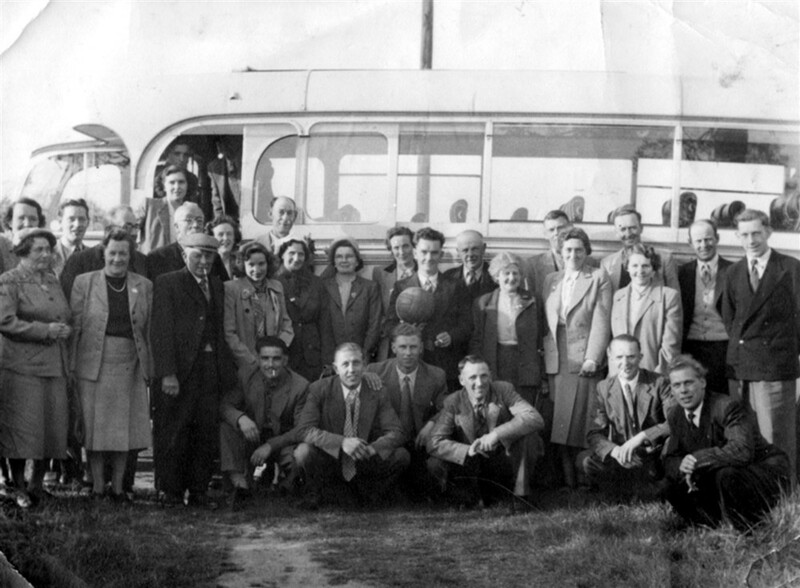 A coach party of villagers enjoying a day’s football outing, date about 1950. In the doorway of the bus: Peter Olley behind Joan Burrows (nee Patchett). Main group, L to R: Mrs Topps, Jeff Flack, Mrs Coy, Mr & Mrs Lane, ? , ? , behind, Earnie & Mrs Right, Mr & Mrs Tommy Jonson, Mr & Mrs Clower, Mr & Mrs Bagnall, behind Mr Coy, front Mrs Tinkler, Frank Topps, Geoff Bolland [it is not totally clear who each of these names points to in the image, where there seem to be more people than are named or indicated here]. Front row, squatting, L to R: ? , Bill Burrows, Mr Glover, Charlie Cramm, Ned Parnham, ?.